Positivity is a powerful change agent. For one thing, people who go through life with the positive perspective that the glass is half full are much happier and more productive than those who see it as half empty. It has nothing to do with how much water is really in the glass. What matters is how we think about how much water is in the glass. Positivity and optimism, then, are intrinsically beneficial states of mind. But that’s just half of it. Positivity can actually change reality. First, people who are cheerful and optimistic have more friends and more opportunities simply because they are more likable than pessimists and cynics. Second, people with positive outlooks are far more likely to overcome challenges and achieve success because they try. People who think they can and people who think they can’t are both right because these beliefs are self-fulfilling prophecies. I’m told that if you put fleas in a jar, they will jump out, but if you put a lid on the jar, the fleas will eventually learn to jump just high enough to avoid hitting the lid. 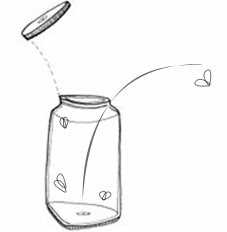 If the lid is later removed, the fleas, conditioned by past failure, will still not jump high enough to get out of the jar. It’s a sad irony that the hopeless and desperate young man who set himself on fire in Tunisia probably had no idea that his suicide would start a chain of events that would topple his government by inspiring other frustrated Tunisians to protest and to try to jump out of the jar that confined them. And seeing it could be done, thousands of angry citizens in Egypt, Yemen, and Jordan have begun their own revolutionary movements, which most certainly will change the political landscape of the Arab world, and which prove that one man can positively make a difference. Sorry, Michael, but this may be an outdated commentary. Self-immolation is rarely a positive act with positive outcomes. Egypt is back under military control, with pronouncements of mass death sentences for some of those who previously protested. Yemen is in turmoil in all parts of the country, including Aden. ISIS, a new anti-democratic phenomenon, claims that it was the organization that struck the Tunisian museum causing more than a score of deaths. Only Jordan, with a stable monarchy, continues some aspects of modernizing, and responsible behavior with respect to refugees. And the largest plurality of Israelis seems to have been obtained by implacable opposition to a two-state agreement with Palestinians, and fear of the democratic behavior of their own Arab citizens. This certainly has changed the political landscape of the Arab world, but not yet for the better. Perhaps one man can positively make a difference, but he surely has not yet made a positive difference. You just sharpened your point about positivity with martyrdom. That’s a huge logical jump there. I think it’s an interesting question, can suicide be an act of ultimate positivity? I doubt the mental state of the “martyr” was one of hope, rather, I believe in nearly all cases the person who commits suicide is seeing themselves as in a hopeless situation and the last thing they can do on earth is get attention of the world that is largely alienated them in some way. That attention seeking or statement they want to make comes more from a feeling of hopelessness and desperation; not positivity. Suicide has more to do with the feelings of pervasiveness of problems in their life, the permanence of the problem they perceive, and it’s their personal problem. This is essentially the definition of pessimism; not optimism. I just don’t buy your conclusion. Good site though. 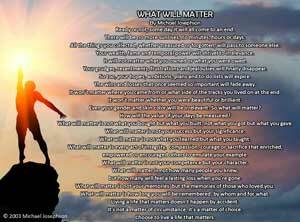 What Will Matter | Andy commented on COMMENTARY 924.1: Fleas and RevolutionariesAs a woman who was born to a Muslim father and a Christian mother in Lebanon over fifty years ago and have since studied and experienced the bloodshed and tyranny of the regions, I would like to suggest that Andy and Bill refrain from further comment regarding these areas as they do not have a clue about the far reaching behind the scenes actions and power plays of the current situation. I suggest that you both do not come back hard at me regarding these issues as you will not be getting a response. The people will be the decision makers in this story and if you believe that being positively optimistic about this is a delusion than maybe you should stop being so pessimistic and conflict oriented as opposed to hoping for the peace that will come after a lot more blood has been spilt by those who believe they are martyrs. Thank you and I always see a glass as half full. Hi there, your below email says I’m confirmed as subscribed to What Will Matter. However, I’m still haven’t received any emails since the one below. Thanks for looking into this and please let me know if you have any questions. How often are these posts published?